Ever since Agents of S.H.I.E.L.D. debuted on ABC in the fall of 2013, the show has featured a number of connections to the Marvel Cinematic Universe at large. Samuel L. Jackson showed up early on in the first season as Nick Fury, and towards the season's end, the events of Captain America: The Winter Soldier had a huge impact, featuring the fall of S.H.I.E.L.D. itself. The show also helped address the aftermath of Thor: The Dark World, featuring a special guest appearance by Jaimie Alexander's Lady Sif in the show's second season. With Captain America: Civil War currently playing in theaters, fans have been wondering how the show will address the events of this blockbuster. Today, we have new details about how the movie's plot will affect this show. There will be plenty of SPOILERS for Captain America: Civil War and Agents of S.H.I.E.L.D., so read on at your own risk. At the heart of Captain America: Civil War is the Sokovia Accords, which were put together by the world's leaders in the aftermath of the destruction seen in Avengers: Age of Ultron. The Accords want to create a regulatory commission to oversee the Avengers, who will only go where this governing body sees fit. Iron Man (Robert Downey Jr.) is in favor of the Accords, while Captain America (Steve Rogers) is not, setting the stage for this Civil War. Entertainment Weekly caught up with Agents of S.H.I.E.L.D. star Clark Gregg, who plays Agent Coulson, who revealed the Sokovia Accords will also come into play on the show, in regards to the Inhumans. "The Sokovia Accords have their own specific purpose within Civil War having to do with the powered people that we've met in The Avengers. It's representative of how our show functions within the Marvel Universe, in some ways, in that it's all connected. That ripples through our show because suddenly all these people who are Inhumans in our corner of the universe, they're all subjected to the Sokovia Accords. That dilemma rises up in our show about the people who feel Inhumans should be registered and those who feel that's a first step to them being sequestered, imprisoned, exterminated." In tonight's episode, Emancipation, the S.H.I.E.L.D. team finds themselves just as divided as the Avengers in Captain America: Civil War over the Sokovia Accords, and what it could mean for the future of the Inhumans. After tonight's episode, ABC will air the two-hour Season 3 finale on May 17, so we'll have to wait and see how the events of the movie will affect the show. Series star Elizabeth Henstridge revealed that no member of the S.H.I.E.L.D. team is completely on one side or the other, when it comes to the Accords. "Marvel is so good at taking really huge political and philosophical issues and putting them through a prism and making them something that you can have an opinion on, but there's distance and you can argue both sides,. The characters fall on different sides. It's not so black and white. There's no one character in the show that's full-force for one side or the other. It's a really cool link philosophically that we're both questioning the same morals or politics. Can two different beings, in a way, that share so much but then are so different, can you live side-by-side together peacefully? We've been to that place where we have documented, and it didn't work. It's strange that we're having the argument again, but that's what humans do: You don't notice that history is repeating itself." Chloe Bennet also revealed that she thinks this season has featured a "smaller, more personal" Civil War, and that they've been dealing with the primary issues in the movie all season, but on a different scale. Executive Producer Jeph Loeb also commented on how the movie comes along at an interesting time, with several segments of our own real-life society divided against each other. Here's what the executive producer had to say about how timely the movie and this show have become. "Marvel always works best when it's commenting on the real world. It's safe to say it wouldn't be hard to find a recent time where man's tolerance toward man or woman is being stretched pretty thin, whether it's because of race, gender, or religion. We can't quite figure out how to get along. The Civil War is happening around us. In our world, that translates as whether or not you have powers. For a lot of people, that's very scary when someone is different." With Agents of S.H.I.E.L.D. tackling the Sokovia Accords, many may wonder where the show's characters stand, with Captain America or Iron Man. Elizabeth Henstridge made a surprising revelation that her character Simmons is actually siding with Team Iron Man, despite her history with those who have superhuman abilities. Here's what the actress had to say below. "She started off being scared of people with powers, and almost had a snobbish attitude toward them, and an arrogance of her superiority in terms of intelligence and how maybe people with powers were shortcutting to a solution when she felt she'd earned the right to be able to solve a problem. But she has definitely warmed to the idea. But I do still think she's on the side of Iron Man and relying on scientific qualities, which include documenting, writing everything down, and making sure everything is nice and neat in its little box." Actress Ming-Na Wen reveals that her character, Melinda May, is also torn between both sides, but she wouldn't reveal which side May would ultimately side with. The actress spoke about her history with the Inhumans, and how unstable they are, while she wishes things could just go back to the way they were. Here's what she had to say in her interview with the site. "May is very torn, because on the one hand, she understands the need to have them as allies as opposed to having them as the enemy, especially with Hive [Brett Dalton] in the mix right now and him being able to control the Inhumans. But there lies the dilemma, because as much as we want to believe and trust the Inhumans, they are the unstable, unknown element. For her, she wishes things were back to the old ways, where it was very clear cut that S.H.I.E.L.D. was there to help and to protect the citizens." It has long been established that Clark Gregg's Agent Coulson is a huge fan of Captain America, as we saw in a scene from The Avengers. It shouldn't be surprising, then, to learn that Coulson will side with Team Cap, but not necessarily because of his allegiance to Cap. The actor revealed that he normally would have registered his super-powered assets, like Chloe Bennet's Daisy, but she has become too close to him. "He does end up being Team Cap. In some ways, I think Coulson would've imagined he would be enforcing whatever the latest iteration of the World Council would want in terms of this stuff, but his relationship with Daisy and other Inhumans pulls him very much against that particular side of it. He's very much Team Cap." After the events of Captain America: The Winter Soldier, S.H.I.E.L.D. was dismantled from the inside, but it seems that the show may be leaning towards making this organization viable once again. Executive producer Jed Whedon teased that they're considering these options, but it remains to be seen if this plan will be carried out, or how it will cross over into the MCU as a whole. Here's what he had to say below. "We're dipping our toe into the idea of S.H.I.E.L.D. being a legitimate organization again. But with that would come any rules and regulations that come with government oversight. It's not a coincidence that while we're starting to approach that as an idea on the show, it's becoming more complicated for that to be a reality that we would live in." Of course, The Avengers in the MCU still don't even know that Agent Coulson is alive, after his death in The Avengers and his resurrection for Agents of S.H.I.E.L.D., so we'll have to wait and see how that plays out. There will also be a much smaller connection to Captain America: Civil War, when Agent Coulson (Clark Gregg) finds out that Peggy Carter (Hayley Atwell) has passed away. Here's what executive producer Jeffrey Bell had to say about referencing Peggy Carter's death. "S.H.I.E.L.D. was birthed out of Peggy Carter and Howard Stark. Any time we can make a connection to her, whether in a flashback or dealing with what's happening now, it makes the universe smaller." 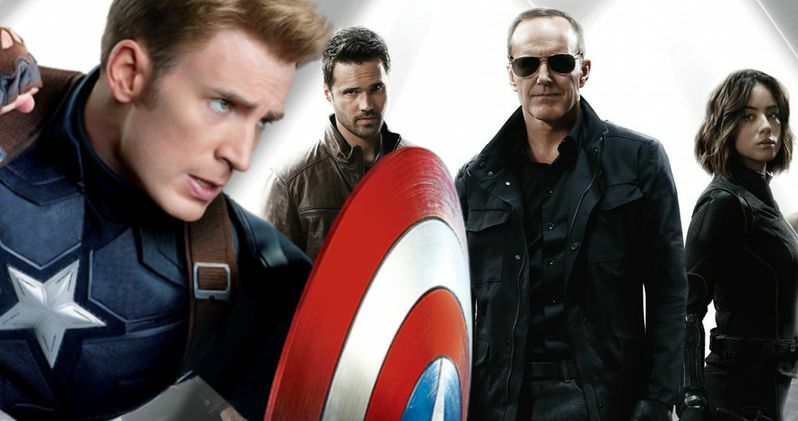 We'll keep you posted with more updates on Agents of S.H.I.E.L.D. and how it connects to Captain America: Civil War as soon as we have more information. We don't know if the two-hour season finale will address the events of Captain America: Civil War as well. Agents of S.H.I.E.L.D. was renewed for a fourth season back in March, with the series set to return this fall on ABC.